VariAware LLC, a client of Lab 651, released their “Vitals App” at a press release yesterday in conjunction with the Saint Paul Police department and the Autism Society of Minnesota. 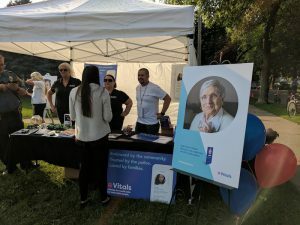 The release was followed up by joint efforts between members of VariAware and Lab 651 teams attending a “Safe Summer Nights” event in Saint Paul where we were able meet and talk with those in the community who might benefit from this service. The Vitals App, is a system that creates safer interactions between law enforcement and people with behavioral, mental health, physical, and developmental conditions. This is possible when the officers are using a smartphone application and the individuals with conditions are carrying a small device (beacon) in their pocket or wallet. The service works with a number of medical conditions. VariAware has a website where those interested in the service can download the apps, learn more about the service, and connect with other individuals who have various mental, physical or other medical conditions. Lab 651 looks forward to continuing to work with VariAware as are able to expand the offerings of their solutions to help those individuals in times of need.